I am happy to read your successful experience with the 1948 Rule. Congratulations! Just a short question. How long it took for you to get your birth certificate register at the comune, after the delivery of the positive judgement? And, how long it took to get your passport delivered by the consulate after that? My brother and I want to find out if we qualify for Italian citizenship. If I read category 6 it seems like it. CATEGORY #6: Your mother was born in your native country after January 1st, 1948, your maternal grandmother was an Italian citizen at the time of her birth, and neither you nor your mother ever renounced your right to Italian citizenship. If citizenship is acquired by birth in your country and you meet all these conditions, you qualify for Italian citizenship jure sanguinis. Italian Grandmother married south african grandfather (while still in trieste italy) in 1945. I found the marriage certificate. both grandparents moved to south africa. Brother and I born in south africa. According to my knowledge, you directly qualify for Italian Citizenship. If your GM has not expressly renounced to her Italian citizenship before the birth of your Mother, then the latter has acquired her right to the citizenship at the moment of her birth; the same than you and your brother. There are two key elements in your case. First, the non express renunciation to the Italian citizenship in the case of your GM, and, secondly, the fact that your Mother was born after the entrance into force of the Italian Republican Constitution, in 1948.Therefore, the 1948 Rule that we are discussing here is not applied to your case, which is a good news indeed! This means that you can go directly to the Italian consulate with jurisdiction in your home town in SA, and start your procedure there. Of course, before that you need all documents that prove that your are descendant of an Italian person, your GM. You will need her birth certificate, marriage certificate (the Comune will send them to you by post, if you ask for), and her death certificate. The same (relevant) documentation is needed in connection with your mother, brother and yourself. You will need also a certificate from the national electorate authority in SA, certifying that non your GM or your Mother have expressly renounced to the Italian Citizenship. You can ask the Italian Consulate about who is the specific authority in SA with the competence to issue this document. So, the best advice possible is just call/visit the Italian consulate with jurisdiction in your case, and ask for the documents that they need, in order to start with the procedure of the recognition of your citizenship. So it is indeed possible for me to get an answer back in a timely manner. I submitted paperwork to Luigi in October and my court date is at the beginning of May 2014. Im hoping to get an answer soon. He said my case looks good. My Nona is till alive, but living in America w/my Mother. My Father is Spanish/Mex American. My surname is Spanish/Mex even though my Italian Grandmother is from Gabro, Italy. I was concerned this would be a problem (the judge seeing my surname thinking its odd). I would imagine after he sees the paperwork he will know my bloodlines clearly. Your thoughts and advice? Anyone? Congratulations! I am happy for you and for the fact that the Italians Courts are firmly applying the same well established jurisprudence related to the maternal line citizenship. I am also waiting for the judicial resolution of my case. Actually, the public audience with the government will come soon. May I ask you a question? How long it took for the court to decide, and handled down the judgement, after the celebration of the public audience in your case? I just would like to share with you that last week the hearing in my case took place. And, as expected, the State didn't appear before the Tribunal. This is indeed a good news. The Italian Home Land Ministry (Ministero degli Interni) is still tacitly and continuously accepting the jurisprudence of the courts by means of no opposing to the claims based on it. The next step will be the delivery of the Judgement in the case, which -hopefully- will be a positive one. I would like to have a contact email for your attorney. Researching in the provincia di Treviso, Italy, Provaglio Sopra, Val Sabbia of Brescia. We used Luigi Paiano to obtain Italian Citizenship for my son christopher. It took less than one year and he was successful. My son wants to play soccer in Europe and this gives him the opportunity. I could not recommend Luigi enough. He did exactly what he said he would do at the cost he estimated. I have already told many friends who will use him from the United States. Thanks Luigi. I recently won my so-called 1948 rule case. In other words, my Italian citizenship was recognized by the the Ordinary Tribunal of Rome (Tribunale Ordinario di Rome, Sezione Civile), as an Italian descendant of a women born before 01/01/1948. The lawyer that I hired in order to represented me before the tribunal was Avv. Luigi Paiano. Before the Italian Tribunal I pursued my Italian maternal line of ancestry. My mother was born in Argentina in 1941 (before the entrance into force of the new Republican Italian Constitution in 1948). Her mother was born in Argentina too in 1912, and was married with an Argentinian citizen (my mother's father) in 1931. May grandmother (my mother's mother) was a daughter of an Italian couple (my great grandparents) emigrated from Tuscany to Argentina at the end of the 19th century. Due to the fact that the current legislation regulating the Italian citizenship still does not recognize to women the right to transmit their Italian citizenship to their children, born before the entrance into force of the current Italian Constitution (01/01/1948), my mother -who was born in 1941- was prevented to acquire the Italian citizenship from her mother and, consequentially, I was also unable to do it. In 2009, I learnt about the existence of a change on the constitutional interpretation of the applicable rules to the Italian citizenship, made by the Italian Supreme Court (Cass. S.U. Sentenza n. 4466/2009, 3-25/2/2009). And, being a Lawyer myself, I intermediately understood that I would have great chances to win my case in Court. Therefore, I started my research on internet (mostly in Italian) in order to get as many precedents as possible in connection with this kind of cases. And among those lawyers that successfully pleaded before the competent tribunals, I found Avv. Luigi Paiano. Because I did my own research and legal assessment of the case, I was absolutely sure (well, 98 %) of my chances to win the case. The only thing that I needed at the time was to find a reliable and experienced lawyer, that would be able to deal with the case without any hesitation, making my case to navigate smoothly through the judicial and bureaucratic Italian waters. So, when I visited Luigi at his office in Bologna last year, I was just looking for that, for a feeling of trust and reliability. And I must say that I left his office fully satisfied with his professionalism and legal accuracy. Therefore, I gave him the mandate to start with the procedures. Last year in June he introduced my case to the Court, and this year in March the Court in Rome ruled that myself, my brothers and uncles were Italian citizens ius sanguinis. During the entire judicial process, Luigi was keeping me informed of all relevant steps. So, I must say that I have nothing to say but recognition of his professional work and personal dedication to this case. What is missing now are all the bureaucratic steps that need to be taken in order to register the ruling, together with the relevant certificates, at the municipality (comune) were my great grandfather was born, and then require the issue of the Italian passports at the competent consulates. So, I will definitely recommend the services of Avv. Luigi Paiano, not only because he delivered as I expected, but also because he has the right professional experience to deal with this kind of cases. And, as long as the precedents of the Italian Supreme Court will not change, there is just a little chance to NOT win the 1948 rule cases! I heard about the possibility to get the Italian citizenship in 2002, through a friend; I got all the required doc.s but I was informed that my case is in the 1948 rule. At the time there were some isolated actions, but the chances to win were very low. In 2011 looking at the Dr. Luigi Paiano site I saw at that time he had won 3 cases in the Italian Court, and his site reported that it was indeed possible. My hopes reborn and got in touch with Luigi. He explained to me every point carefully and clearly demonstrating a lot of knowledge on this subject, which brought me a lot of confidence and further increased the hopes of getting my Italian citizenship. I started the process in the 2012. He filed an action by the Court of Rome, and in 2013 I had the positive surprise: I received the judgment recognizing my Italian citizenship. I was speechless so happy, my case was dismissed in less than a year! From the beginning I trusted in the advising of Dr. Luigi and his staff, and each time I talked to him I was more confident and sure that my case was in good hands. Luigi always reported every step of the process showing knowledge, competence and transparency. I was very happy in his choice, and it was worth trusting him in such an important point in my life. jennabet wrote: Since there are no Italians at all in your lineage on either side paternal or maternal from grand-father on down, I would assume you have very little, if any connection to Italy or it's culture or traditions. I think this is exactly what Italian lawmakers were trying to prevent when they instituted the 1948 rule. Apart from being extremely bitter, Jennabet is also very misinformed. Italian lawmakers never "instituted" the 1948 rule. The pre-1948 rules can in fact be traced to the Constitution of the Kingdom of Sardinia, which stipulated that women were subordinate to their father or husband. That discrimination was in fact REMOVED by Italian lawmakers, who wrote a new constitution in recognition of the birth of the Italian Republic in 1948. Lawmakers further expanded the scope of Italian citizenship in 1983 and 1992. I am another happy client of Sig. Paiano and am currently waiting for the decision from the 'Tribunale' in Rome. Assuming my case is successful, I will be registered as a citizen in Tuscany. That will make me 100% Italian in the eyes of the Constitution and the law, no more or less than any other citizen, much to Jennabet's disappointment. Except perhaps when you use the National Health Care system in Italy and find your doctors "puzzled" enough to ask about your heritage (for medical purposes, of course) because you don't look Italian or have an Italian name. What then? Will you say they're "bitter" as well? Or might you just try to sue them, per the good, old American solution for everything? jennabet wrote: Except perhaps when you use the National Health Care system in Italy and find your doctors "puzzled" enough to ask about your heritage (for medical purposes, of course) because you don't look Italian or have an Italian name. What then? Will you say they're "bitter" as well? Or might you just try to sue them, per the good, old American solution for everything? More misinformed rubbish. Italian healthcare cards don't give any indication of the holder's citizenship. Nor do drivers' licenses. In addition, plenty of foreign citizens live in Italy and are members of the national healthcare system. None of the Italians I've ever met have a problem with foreigners living in their country. It's only you... Many of my Italian friends even encouraged me to take citizenship. No, YOU are the one who is mis-informed. 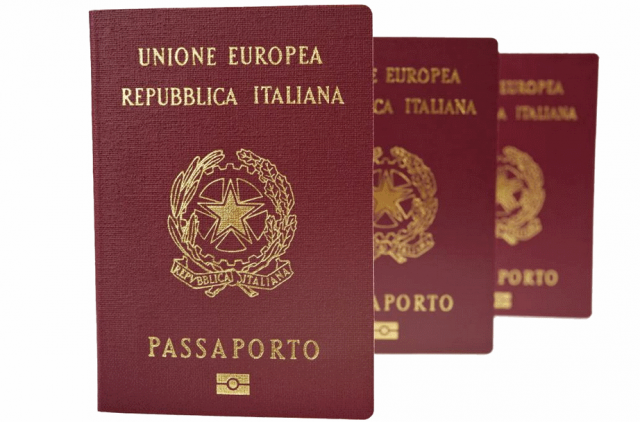 Carta d'Identita has citizenship status and marital status. No one gets on the health care roles without an ID card. All information on ID card is transferred to the health service. The doctor brings up your records and it's all there for them to see, including your citizenship.